If you are one of those like myself who love the ebook format here is an opportunity to enjoy WHEN PRINCIPLE WAS KING in ebook or ibook form. Coming soon to Kindle or Smashwords will be my new book about the life principles of Dr. Jack Hyles. These books can be downloaded within a instant. It is really amazing. This is a 408 page book divided into three sections of PERSONAL PRINCIPLES, MINISTRY PRINCIPLES, and MOVEMENT PRINCIPLES of the man whom God used to be one of the fathers of the big church in America. He built the world’s largest Sunday school in averaging over 20,000 a Sunday. If you will go to Kindle or Smashwords and type in Bob Gray Sr. you will find many of my books in ebook or ibook. You can download them to your ipad, iphone, or other Android phone. Also, JUST A THOUGHT Volume 5, 6, 7, 8, 9, and 10 will soon be added to the ebook or ibook list. I have new books LET’S TALK ABOUT JESUS and LEADING FROM THE FRONT that will also be added soon as ebook or ibook. Just keep checking and they will soon be there. Great week of soul winning with 7 trusting Christ and 4 lined up for baptism this Sunday. I will flying to Indianapolis, IN., to preach for my friend Pastor Todd Poynter. By the way Pastor Poynter will be preaching the following week at the INDEPENDENT BAPTIST CONFERENCE to be held in the Milwaukee, WI., area. 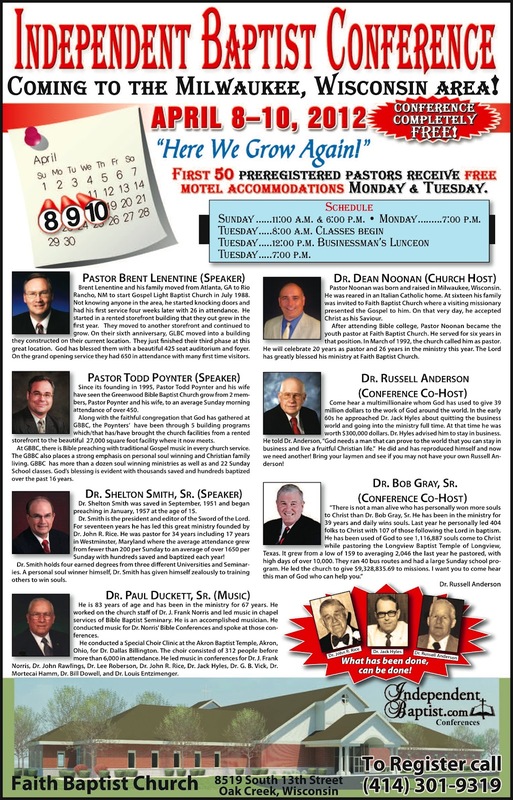 There are a few free motel rooms left for pastors and their wives. Please call now and reserve your room!